For his latest sonic guided tour to the shadowy, primal places inside ourselves, techno-shaman Steve Roach elicits the help of didgeridoo guru/ambient craftsman Brian Parnham. Together they carve out a deep and surrounding tribal journey that carries on the legacy of Roach’s desert-ambient works and also takes the listener into THE SERPENT’S LAIR-style darkly meditative spaces. Roach has said recently that he and Byron Metcalf are working on a follow-up to Lair, echoes of which were heard in the grooves the two laid down at Soundquest Fest 2010; between that, his recent NIGHTBLOOM release with Mark Seelig and now this, it’s clear that Roach is stockpiling and refining his grooves in this direction, perfecting his role as lower-world explorer. Wherever this trip is taking us overall, THE DESERT INBETWEEN is a stunning stop along the way. 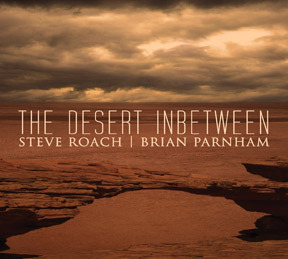 THE DESERT INBETWEEN is as much Parnham’s disc as it is Roach’s, his serpentine didg coils burrowing into your head to control your mind under cover of Roach’s swirling sounds. On the lead track, “Opening Sky,” the didg pairs up nicely with Roach’s ambient guitar, the crying chord-shimmer that puts me in mind of STREAMS & CURRENTS. There is a strong sense of trading-off here, each man leading the way for a stretch, then letting the other take the front. In this manner, THE DESERT INBETWEEN slides, glides and sighs its way through crossfades of feeling, power and subtlety, energy and quiet. Listen to the eerie muted radio voices haunting “Ancestral Passage” giving way to rolls of thunder and desert-wind pads. Listen to the space late in “Return to the Underground” where the tribal briefly yields to the technical, with pulsating wave forms dripping over edgy pads — something of a wake-up call to your tranced-out mind. Or fall into the driving, percussion-fed downward charge of “Serpent Gulch,” a prayer filled with power and potency culled from a rhythm built on analog-synth lines, clay pots, drums and Parnham’s curling, insistently chanting didg. Then, when it relents for its last few minutes, accept that you have no choice but to follow that flow, your exhilarated pulse and breathing coming in line with the vast space that the duo lay out before you. They do it again with the ritualistic rhythms of “Somewhere Between,” about the darkest track here, featuring the rich tones of a waterphone vying with sharp metallic clanks and clatters, the patterns coming out like a makeshift invocation, Parnham’s hypnotic drones stirring the mix, bringing you back up to the soft space of “Spirit Passage,” which has a fantastic callback with the reappearance of the ghostly voices. Like many of Roach’s voyages, this one wends its way to end in a contemplative space, the trip completed and you left alone to feel the resonance gently fade. After dwelling inside this music literally for hours on end (and gladly so), what strikes me about THE DESERT INBETWEEN, outside of its depth of effect, is the depth of sound. It is a richly dimensional concatenation of purposeful sounds that ricochet in rhythm around each other to create the space as they go, every one of them integral. Parnham’s contributions of didgeridoo, synth and percussion help fill out and solidify the thing while adding his own new hues to a fairly familiar palette. Take this journey often. THE DESERT INBETWEEN is a Hypnagogue Highly Recommended CD.